becomes more strict over time. Joseph Smith received a revelation of comfort for Emma. The original document has been lost. It was at a time when Joseph was in serious legal trouble. 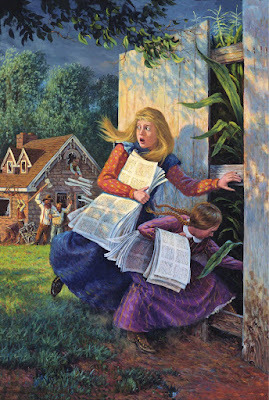 Oliver Cowdery and David Whitmer are assigned to record Joseph Smith's revelations. 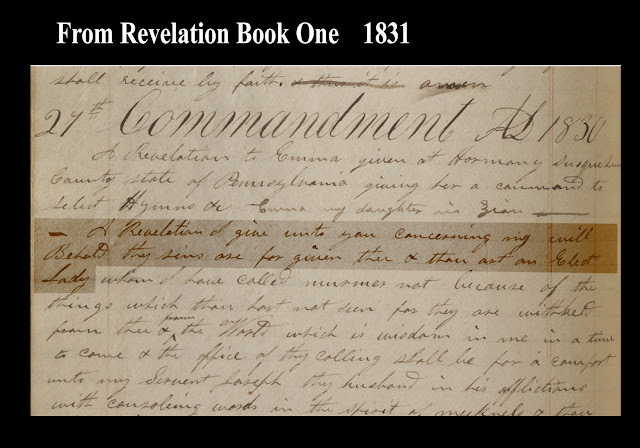 The documents are copied into a book called "The Revelation Book". Below is a scan of their handwriting. 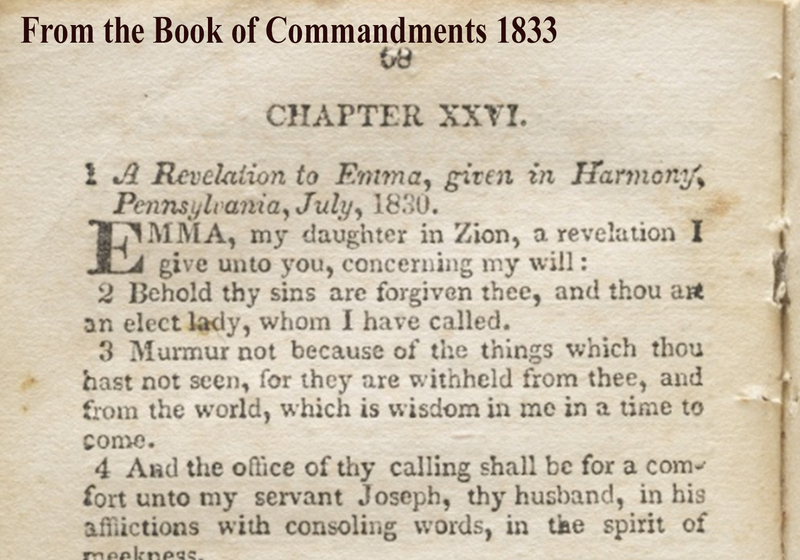 The revelation to Emma is called "27th Commandment". A group of four to five hundred Missouri vigilantes stormed the Church's printing office in Independence and destroyed or confiscated much of the contents. The text below is from one of the few books that was made from rescued manuscripts. There are minor changes made from the 1831 version. A teenage girl named Fanny Alger is hired to live and work in the Smith home. She helps with Emma with the children, cleaning and cooking. At some point she starts a relationship with Joseph Smith. 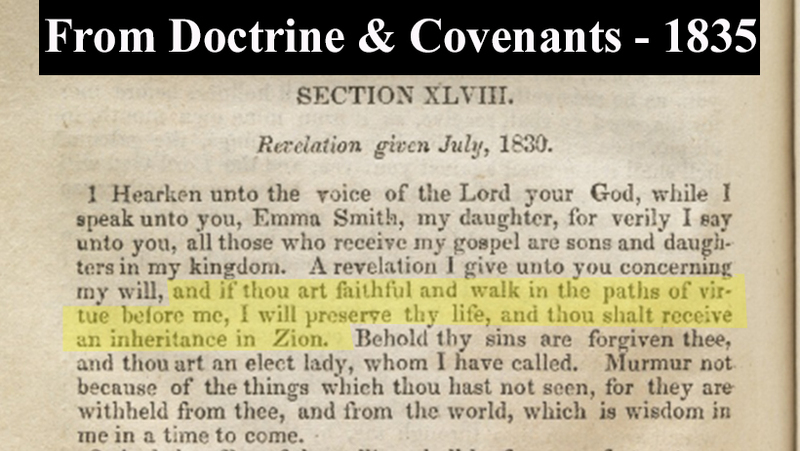 The book called the Doctrine and Covenants was published in 1835 in Kirtland, Ohio. The Emma Smith revelation was put in Section 48. A conditional clause is added to Emma's revelation. 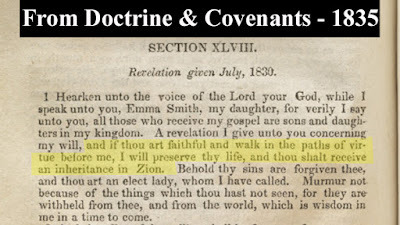 In the 1831 version, Emma was called and "Elect Lady", but in the 1835 version it is given "IF THOU ART FAITHFUL and WALK IN THE PATHS OF VIRTUE". Why would a conditional clause be added? Is it possible that Emma had begun to grow weary with Joseph's polygamy / adultery? Would this IF statement put greater pressure on Emma to accept Fanny Alger and the relationship she had with Joseph? 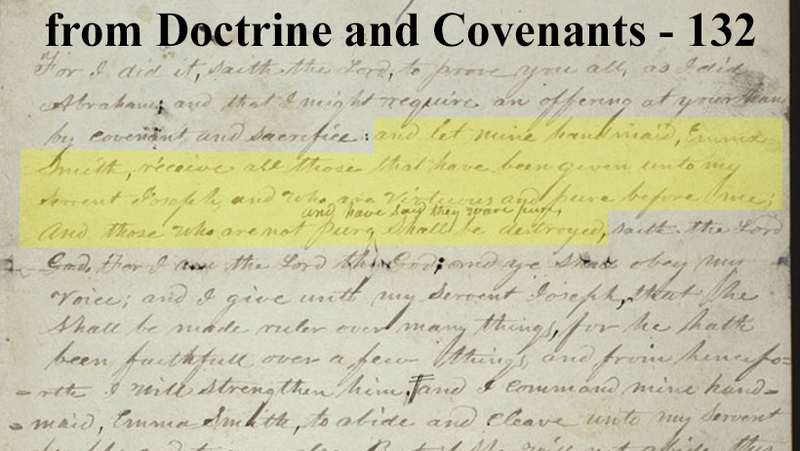 For context, be aware that the Kirtland Temple was dedicated after this revelation came out. At that time, Joseph received the "Sealing Power" from an angel. Section 132 is recorded. This section puts even more pressure on Emma Smith to conform. Saying that she might be "destroyed". 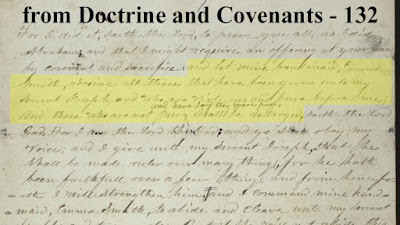 "and let mine handmaid Emma Smith receive all those that have been given unto my Servent Joseph, and who are virtuous and pure before me; And those who are not pure <​and have Said they ware pure​> Shall be destroyed"
The Emma Smith revelation is now found in Doctrine and Covenants 25 in the present Utah - LDS Scripture. It is also worth noting that the source of the revelation changes between 1830 and 1835. 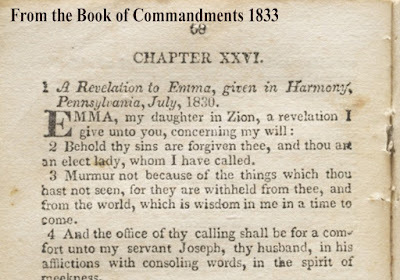 In the 1830 version, Emma is called, "My Daughter in Zion", but in the 1835 version she is addressed saying, "Hearken unto the voice of the Lord your God, while I speak unto you, Emma Smith, my daughter; "
Young women saving the papers of the Book of Commandments.